Ned, George and Arthur Goodchild were three brothers – my uncles – who volunteered to serve in Kitchener’s New Armies in 1914. 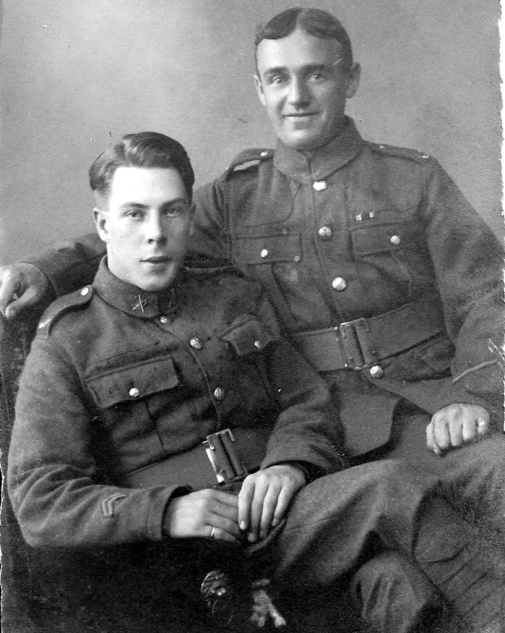 All joined the Suffolk Regiment (see cap badge, left): George attested on 24 August in 7th Battalion, and Ned followed on 8 September in 9th Battalion, where he was joined a week later by Arthur. They all wrote frequently to their mother, who kept their letters, the last dated July 1916. These came to me on the death of my mother, their sister. With my cousins’ approval, I used them to write an account of their fathers’ army lives, now online at www.goodchilds.org. Why did they volunteer? As agricultural labourers, they clearly felt that army life could not be worse than farm work. While Britain’s small regular army was despatched immediately to France, the New Armies remained at home to be trained up by inadequate numbers of senior officers and NCOs. Obsolete or non-existent rifles, no uniforms and poor accommodation in winter 1914-15 delayed the creation of battle-ready troops. Instead of the intended six months, George reached France after nine months and Ned arrived fifty-one weeks after enlisting. Arthur’s war history was complicated. In 1914, he was fourteen months under-age and severely deaf since birth. He spent many days confined to barracks, sometimes (but not always) having failed to hear an order. In March 1915 he was transferred to 3/Suffolk, a Special Reserve unit at Felixstowe. Because he had refused to allow army surgeons to operate on his ear, Arthur believed he was classed as unfit for active service. But the decision was reversed, and he arrived in France at the end of July 1915, ironically a month ahead of Ned. The war on the Western Front in 1915 was dominated by the British assault at Loos on 25-26 September. One of the great set-piece battles of the war, it was also one of the least successful. So great was the slaughter by German machine guns of British soldiers caught on open ground that German medical personnel were moved to come out and assist the wounded survivors to return to the British lines. For 9/Suffolk, the experience was shocking. Civilian soldiers of the New Armies required a gradual introduction to the trenches in order to acquire battle skills. But, having arrived in France on 31 August, 9/Suffolk was held near the coast for three weeks, then marched some 70 miles over four nights and thrown unprepared into the battle on 26 September. In the aftermath, all three brothers were briefly in the vicinity of Loos, although they did not see each other. George’s 7/Suffolk took over trenches at Loos on 30 September. Arthur joined 1/Suffolk at Loos in September and went into action on 1 October. But the battalion was withdrawn a few days later. His experience of trench warfare was terrifying but brief and not repeated. By the end of October, 1/Suffolk was en route to Salonika in northern Greece, where the battalion dug trenches to protect against an attack that no enemy intended to make. Arthur remained there, bored but not endangered, until sent home for surgery on his ear in July 1916. His final war letter was written from hospital in Brighton where the surgery failed, and he was duly discharged from the army as unfit for further service. Ned and George were less fortunate. On 4 November 1915 George received a leg wound in the Hohenzollern Redoubt at Loos. He wrote home: ‘When I got hit there were four of us standing close to each other, talking and smoking, Ford and Palmer they were on my left and they both got killed by the same bomb that hit me, the other fellow was on my right and he escaped.’ Invalided home, George thereafter battled with the medical authorities not to be returned to the trenches. 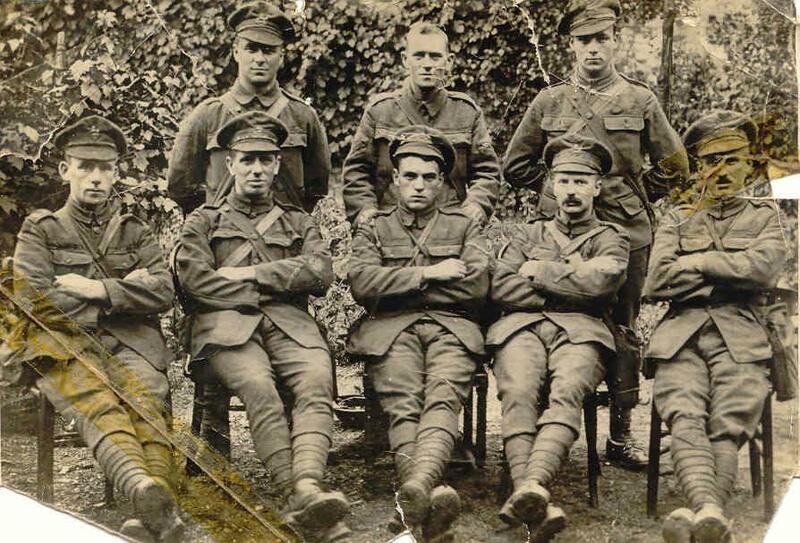 ‘They will send me to France again if they possibly can, but not if I can help it… Scores of my old mates from the 7 batt. have been sent back again but they won’t get me back.’ George completed his war service on home duty in Britain and Ireland and was discharged in March 1919. While George lay in hospital, news came that Ned had been killed on 19 December 1915. After Loos, 9/Suffolk had moved to the Ypres Salient, where the enemy launched the first phosgene gas attack. He was buried that night in a small local cemetery. But when permanent cemeteries were built after the war, there was no trace of his body for re-burial. His parents were informed of his death by letter dated 20 December – officers’ next-of-kin would receive a telegram – but they were still unaware of their loss when his mother next wrote to him on 28 December. 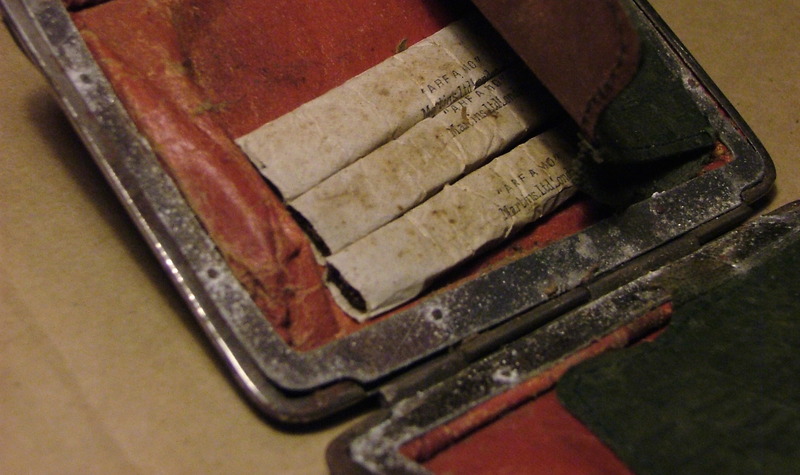 In March 1916 they received the balance of Ned’s pay owing to him (£5-14s-4d) and a small bag of his personal effects which included a cigarette case with his last three “ARF A MO” cigarettes. I found these undisturbed almost a century later (see photo, right). Arthur spoke for all the brothers when he wrote in 1915 that ‘if I get out of the army alive I shan’t work on the land if I can get anywhere else’. After the war, he and George returned to live close to my grandparents in Suffolk, but not as farm labourers. By the time I knew them, Arthur had his own house-building business while George worked for an engineering company in Ipswich. This entry was posted in Belgium, Britain, British, Combattant, Died, Soldier, Suffolk Regiment, Survived on August 1, 2014 by painetvin. Francis Chisholm Young, known as ‘Frank’, was the son of mathematicians William Henry Young (1864-1942) and Grace Chisholm Young (1869-1944). William Young was Associate Professor (1912) and Honorary Chair in Philosophy and History of Mathematics (1913-19) at the University of Liverpool. 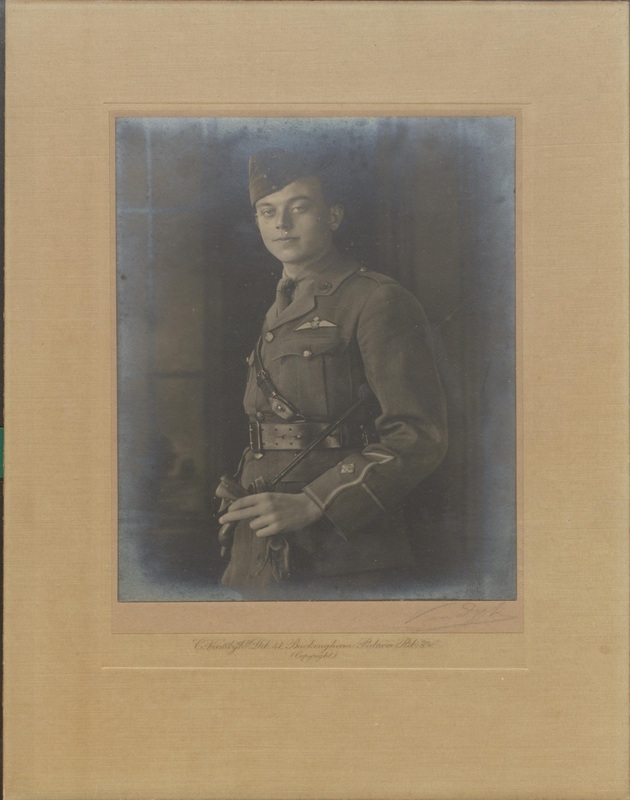 During the First World War, Frank was 2nd Lieutenant, Royal Flying Corps. Frank was killed on active service on 14 February 1917, aged 20. This profile was submitted by Jo Klett, Archivist, University of Liverpool, and is based on material from the University Archive, collection reference D599 and D140. This entry was posted in Britain, British, Combattant, Died, Royal Flying Corps on July 21, 2014 by painetvin. My father, T.L.C. 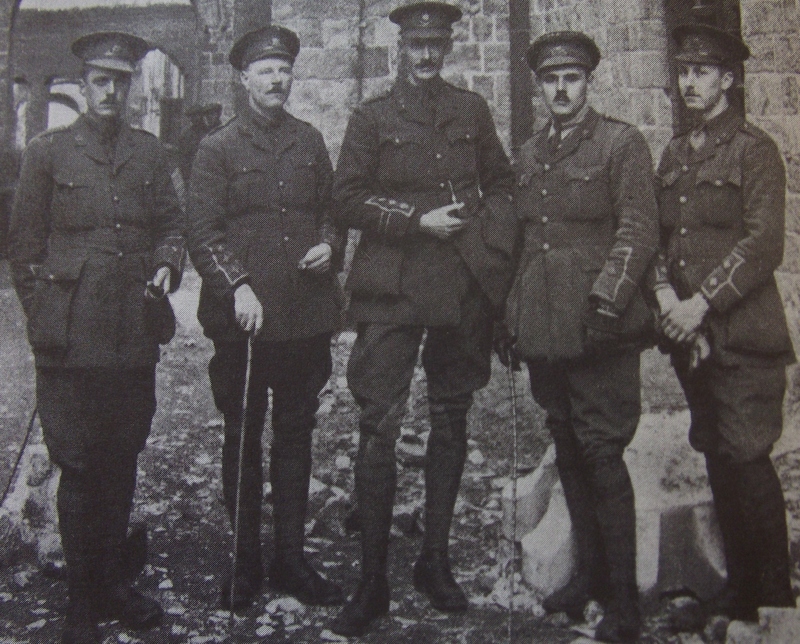 Heald (far left in the photo), enlisted in August 1914 as a Private in the 5th Battalion, Cheshire Regiment (Territorial Force), and left for France as a 2nd Lieutenant on 14 February 1915. Apart from when he was wounded in 1917, he served continuously on the western front until February 1919, ending the war as a Staff Captain. He was awarded the Military Cross, and was twice mentioned in despatches. When he died in 1980, aged 91, I found in the attic a shabby black case fastened with rusty clasps which had formerly been used for holding old 78 records. Attached to the handle was an old luggage label on which was written simply ‘My War’. Inside, there were a number of small khaki clothbound notebooks with squared paper, containing an almost daily account of his experiences at the western front from February 1915 until early 1919. Soldiers were forbidden to keep private diaries, meaning that those who disobeyed this rule left behind much that was valuable. After the war, my father worked in a cotton business in Egypt, returning to England in 1924. In 1932 he took up the profession of solicitor. Then, in 1937, he was given the rank of Lieutenant-Colonel, and raised the 6th Battalion of the Manchester Regiment (Territorial Force), which he commanded until 1940. At the age of 50, he became Officer commanding troop ships which transported soldiers to other theatres of war. Thomas Lane Claypole Heald, b. Southport, 1889, Private, Second Lieutenant, then Staff Captain, Cheshire Regiment, d. 1980, is the relative of Anne Wolff, née Heald, BA Egyptology and Italian (1973), MA (1993). This story is based closely, with her permission, on material in Anne Wolff’s book Subalterns of the Foot: Three World War I Diaries of Officers of the Cheshire Regiment (Worcester: Square One Publications, 1992). It has been edited by Kay Chadwick. Tom Heald’s diaries are held at the Imperial War Museum, London. This entry was posted in British, Cheshire Regiment, Combattant, Military Cross, Post-war story, Soldier, Survived on May 26, 2014 by painetvin. 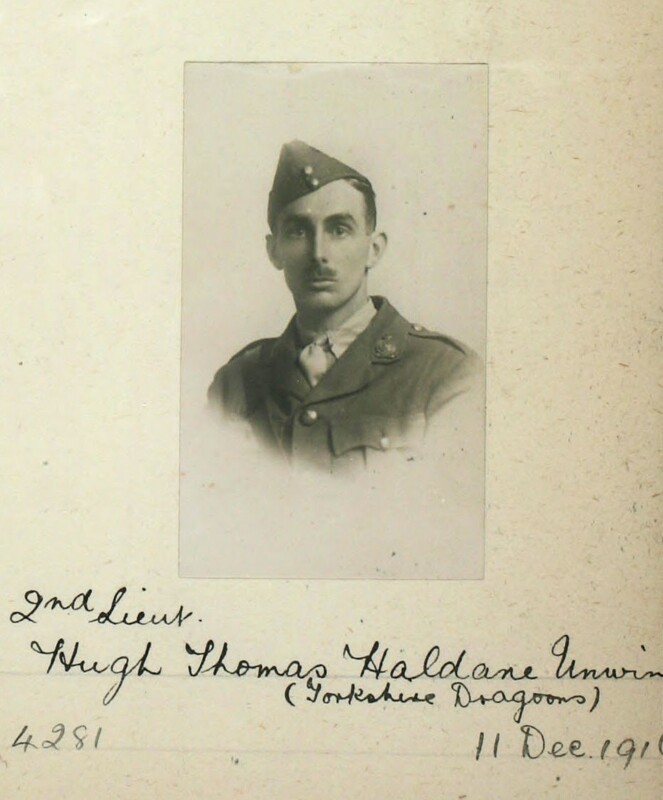 Lt. Hugh Thomas Haldane Unwin, 1/1st York. Dns [Yorkshire Dragoons]. On the night of the 17th/18th September 1918, with eight men of his platoon, he raided a strongly wired pill-box on the north bank of Zillebeke Lake. After resistance, the garrison escaped while his patrol was endeavouring to get through the wire. With conspicuous courage he entered and thoroughly searched the pill-box, obtaining valuable identifications. Three previous attempts to raid this post had failed. Prior to the war, Thomas and Shadforth had emigrated to Canada in search of fortune and adventure, but they returned to join the war effort in Britain. Thomas joined the Yorkshire Dragoons, initially in the ranks, and received his commission signed by King George on 1 January 1916. 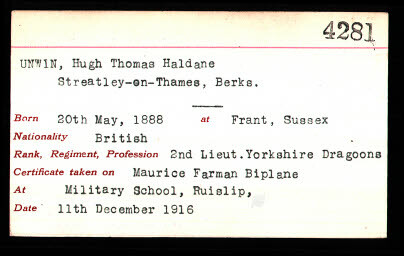 Later that year, he became affiliated to the fledgling Royal Flying Corps, learning to fly in a Maurice Farman biplane at the Military School in Ruislip (see his flying certificate, right). He subsequently flew sorties over the Somme. As a child, I remember him telling stories about his exploits, and in particular about one occasion when the machine gun, which was meant to fire through the propeller, shattered the propeller instead. Fortunately, he survived the crash landing. There was probably a bit of bravado in the way he subsequently told the story, but there was also no doubt unimaginable bravery. And while Thomas was one of those magnificent men in their flying machines, both Shadforth and Gerald were among the last soldiers to see active service on horseback. Shadforth joined the Canadian Overseas Expeditionary Force and served out the war as a Bombardier in the Royal Canadian Horse Artillery Brigade. Gerald was a 2nd Lieutenant in the Royal Bucks Hussars, and earned his own Military Cross as a brigade galloper when ‘he on two occasions went forward, with great coolness and indifference to danger, to reconnoitre the village for machine guns’ (London Gazette, 18 July 1918). My grandfather and his brothers came out of the war and went on to live long, active and successful lives. They were the lucky ones, and they knew it. Zillebecke is about a mile and a half south east of Ypres. This entry was posted in Britain, British, Combattant, Military Cross, Royal Flying Corps, Survived on April 6, 2014 by painetvin. 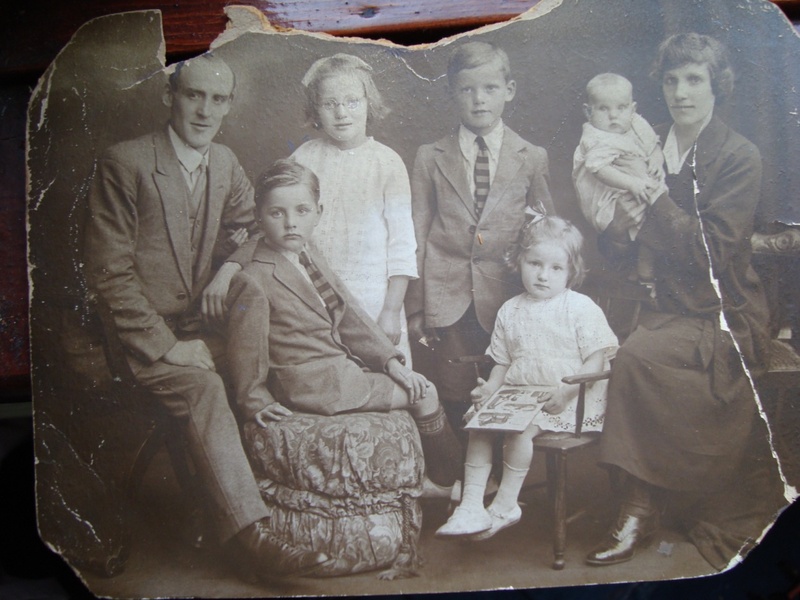 William George Adams (seen on the right in the photo), my great-grandfather, was born at Brockwell Farm on the Chequers estate near Ellesborough, Buckinghamshire, in 1888. His father, George, apprenticed his young son to a butcher, a profession that William hated as he loved animals and could not stand the abattoir. William did not last very long in butchery, and ran away around the age of 16 to join the Buckinghamshire Yeomanry, where he worked for a few years before he was discovered by a boy he knew from back home, who had also joined up. William’s father pulled him out of the Buckinghamshire Yeomanry at vast cost. Between then and the beginning of the war in 1914, William worked on the farm with horses. Maids and Harper, a Croydon firm, were impressed with his handling of the horses and offered him a job in their timber yard. So he moved to Croydon, where he met May, my great-grandmother. William married Dorothy May Scutt in October 1914, not long after the outbreak of the war. Two daughters followed, Edith May (b. 1915) and Doreen Margaret (b. 1916), whose early childhood William would miss as a result of the war. He joined the 13th Battalion of the Middlesex Regiment in August 1914, and was sent to France not long after signing up. He was shot in the arm and gassed quite early in the war, and spent time in hospital. At the time of my grandmother Doreen’s birth in December 1916, William was posted as missing. May, my great-grandmother, received a telegram saying he was dead. But fortunately this was a mistake and he did eventually return home. On one of his leaves, the first thing he said to her was “Don’t touch me, May, I am lousy!” He didn’t even go into the house until he had stripped down and washed himself off. William was a first-class shot and signalman, for which he was paid an extra five shillings per week. He was encouraged to go for promotion by his commanding officer, but refused, for he was a gentle man who did not wish to be responsible for other people. After his refusal, he was sent to Cologne in Germany, with the Army of Occupation. He did not return home until September 1919. My grandmother was almost three years old and did not know her father. She cried when he came home and it took her a few days to approach him. After the war, William enjoyed family life, gardening and going for long walks in the country. He was a country man who knew about wild flora and fauna. He became quite claustrophobic after the war and didn’t like to be enclosed, especially in the cinema. Presumably this was due to his early gassing experience, which left a lasting impression on him. William died in January 1960 in Croydon. This entry was posted in Britain, British, Combattant, Post-war story, Soldier, Survived on February 17, 2014 by painetvin. William McGarry and William Shaw, my grandfathers, both lived around the London Road and Everton area of Liverpool around 1900. Both served in the King’s (Liverpool) Regiment in World War I. This is their story. William John McGarry, my paternal grandfather, was born in Ireland in 1883 and came to Liverpool at a young age with his father, John McGarry, who was a docker. William enlisted in Liverpool on 2 January 1915 as number 3276 in ‘C’ Company, 2/5 King’s (Liverpool) Regiment, and was renumbered as 201076 in early 1917. The address he gave at the time of his enlistment was 28 Date Street, Seaforth. He gave his occupation as a shipper, and is listed as height 5′ 6″, weight 140lbs with good physical development, religion Roman Catholic. Between 1915 and late 1916, whilst stationed at Canterbury and Woking, he was punished a number of times, mainly by being confined to barracks for overstaying his leave pass. He was posted to France on 13 February 1917 (sailing from Folkestone to Boulogne), and returned for a Corps Lewis Gun Course four months later in June that year. The photograph (left) shows the soldiers on that course. My grandfather is seated far right. The expression on these faces says it all. William rejoined the Battalion in July 1917 and was posted to 2/7 King’s (Liverpool) Regiment on 25 January 1918. According to his record and the Battalion War Diary I have managed to obtain, he was wounded and admitted to 3 Australian General Hospital on 3 September 1918. The Diary details the movements of the battalion and all the names of the trenches in which he was positioned. By all accounts, he was a character of strong will, and was pleased to serve his country alongside twenty other loyal employees and willing volunteers at the Diamond Match Company, Litherland. The employer guaranteed all these men employment on their return after the war. William survived physically, and went back to his old employment when disembodied1 on 9 March 1919. Sadly, in 1941, the factory where he worked was bombed, and he moved to the parent building in Garston, which still stands today. It was this event, and the noise of the Liverpool Blitz in 1941, which caused a severe mental breakdown. According to my father, this manifested itself when William would shout out while walking the streets. It is quite easy to imagine how the events of World War II could affect a World-War-I trench veteran. Perhaps we should bear in mind his anxiety with three sons all serving at that time: one was James (my father), a Royal Marine and a D-Day survivor, aged 19; then there was George, who was based with the RAF in Singapore; and finally John, who was with the Merchant Navy. The three sons all lived into their mid-80s, but my grandfather died aged 66 in 1948. He was survived by nine children in total, and was grandfather to a famous Liverpool son, my cousin and poet Roger McGough. William Shaw, my maternal grandfather, was born in 1894. According to family birth certificates, he was a private in the King’s (Liverpool) Regiment in March 1916, and, by April 1917, by the time my mother (pictured standing in the photograph, right) was born, a Lance Corporal (number 11571) in the 1st Battalion. I have no other war details of him, as I can’t seem to access his war records. Can anyone advise? I would be most grateful. I did find some information on his medals (he was awarded the Victory, British and Star medals), but I am not sure that can tell me much. Like my other grandfather, William Shaw survived but suffered tragedy as a latent consequence of the Great War. According to my family, he took his own life during the Liverpool Blitz in 1941, when he heard the news of the death of his son John (Jack), who is seated in the photograph (above right). John was serving in the North Africa campaign driving a truck which was hit. 1. ‘Disembodied’ is a specific Army term for the demobilization of soldiers in certain types of service, notably the Territorial Forces. William John McGarry (1883-1948) and William Shaw (1894-1941) are the relatives of Dr John McGarry, Lecturer in Parasitology, University of Liverpool. 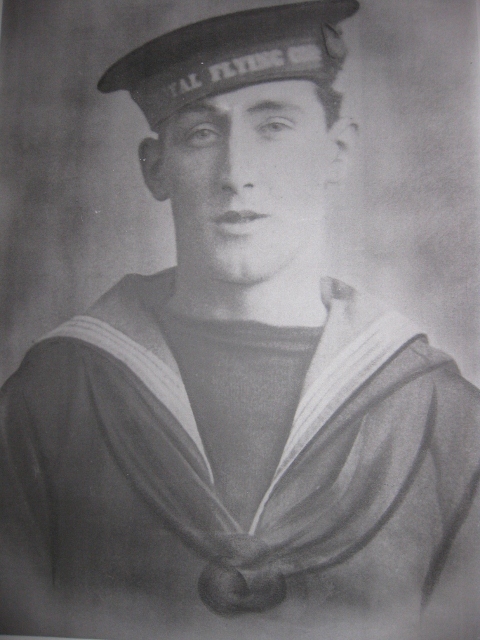 If you can help John to find details of William Shaw’s war service, you can contact him at hydrot1@liverpool.ac.uk. This entry was posted in Britain, British, Combattant, Post-war story, Soldier, Survived on January 29, 2014 by painetvin. Jesse Jestico Marven, my great-grandfather, was born in Plaistow, Essex in 1889. He was working as a dock labourer in March 1909 when he signed up with the Royal Navy for five years, and served initially as a stoker. According to his record, he served on various vessels (Essex, Hindustan, Seahorse, Actaeon, Hermes) and shore bases (Victory II, Nelson, Pembroke), working his way up to Petty Officer (4th class) by 1916. From March 1913 he was paid an additional 4/- per week for ‘air service’ and was transferred to the Royal Fleet Reserve in Portsmouth, home to the newly formed Royal Naval Air Service (RNAS). Jesse was part of Drake Battalion and went to Belgium at the start of the First World War, but was transferred to the Central Air Office at the end of 1914. He was issued with the 1914 star. Jesse continued in the air service until the end of the war and was transferred to the RAF when the RNAS and RFC were merged in April 1918. In the photo (left), he is wearing naval uniform with a Royal Flying Corps cap, so presumably it dates from just after the merging of the two air services. He continued in service with the RAF until 1921. Jesse married Ann Kinnear Houison (born in Leven, Fife, 1889) in Edinburgh on 4 February 1914. On the basis of the dates of his air service and his marriage, it must be assumed he spent time prior to 1914 at Leuchars, which the RFC used as a Naval Fleet Flying School. He may also have spent time on HMS Jackdaw at Crail, which was also used for RFC training, or the Turnberry aerodrome in Ayrshire. Jesse and Ann continued to live in Leven, and had four sons and one daughter (two of whom survived into the twenty-first century), including my grandad, also called Jesse, born in 1917. Jesse Jestico died in 1956 at the age of 67. My dad, one of nine grandchildren, remembers him well, and has passed on several (sadly unverified!) tales about him. Family lore has it that Jesse Jestico learned to fly in France, that he landed his aeroplane on Leven golf course, and that he was the last person officially allowed to fly his aeroplane under the central arch of the Forth (rail) Bridge. Jesse Jestico Marven, b. 1889, Plaistow, Essex, d. 1956, Leven, Fife, relative of Dr Lyn Marven, Lecturer in German, CLAS. This entry was posted in Britain, British, Combattant, Post-war story, Royal Naval Air Service, Royal Navy, Survived on November 7, 2013 by painetvin.